Habit: Perennial herb, rhizomed, densely stiff-hairy, occasionally glabrous distally. Stem: erect or decumbent proximally, (0.8)2.1--6.6(9.2) dm, many-branched distally. Leaf: basal not rosetted, early-deciduous, 2--9(14) cm, obovate to spoon-shaped or ovate; mid-cauline (1.5)2.6--9.3(13.2) cm, (0.7)1.2--3.1(4.5) cm wide, oblong to lanceolate, obovate, or oblanceolate, base lobed to clasping, entire to +- dentate. Inflorescence: panicle, elongated; rachis glabrous or puberulent, hairs curved or straight. Flower: sepals 1.7--3 mm; petals 3--5 mm, 1.2--2.4 mm wide, obovate, white; stamens 6. Fruit: 3.5--5.8(7) mm, (3.5)4--6.2(7) mm wide, obovoid, tip wingless, notch 0; valve walls thin, smooth, glabrous, generally not veined; style (0.8)1.2--2(2.3) mm; pedicel ascending to spreading, 5--16(19) mm, cylindric, glabrous or sparsely puberulent adaxially. Seed: 1.5--2.3 mm, ovate. Chromosomes: 2n=48,80,128. 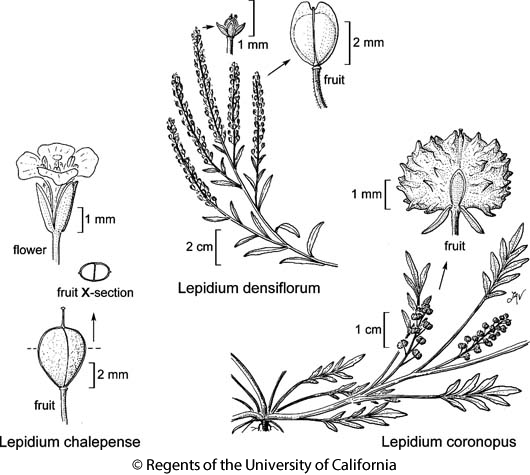 Citation for this treatment: Ihsan A. Al-Shehbaz 2012, Lepidium chalepense, in Jepson Flora Project (eds.) Jepson eFlora, http://ucjeps.berkeley.edu/eflora/eflora_display.php?tid=89305, accessed on April 19, 2019.